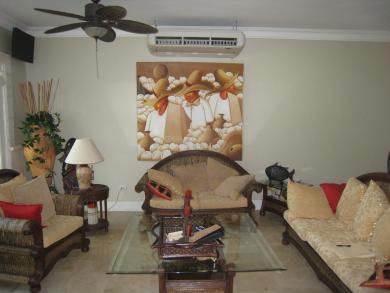 A lovely end unit ground floor apartment in this upscale, secure complex. Size and luxury mark this beautiful spot nestled in the tropical trees and cool breeze of Sosua Bay. Out front the dive boats visit each day to see the sights and vacationers relax on the beautiful beach with its crystal clear water. A one minute walk to one beach and 5 minutes to a second. This is a fine apartment built with top quality materials---all marble floors, marble bath, granite kitchen and bathroom counter tops, mahogany woodwork all through with cedar lined closets in the bedroom. This simply is a gorgeous place to live or rent.